The Game Plan: The Hoyas are arguably the most talented team in the Big East. Unfortunately for them, they lack talent at the most critical position, point guard. Smith-Rivera is their most talented player, and he does play the point for them, but a point guard he is not. DSR’s numbers have gone down from last year when he was playing primarily off the ball. But given that JT3 only has one true PG on the roster, and he’s an unheralded freshman, DSR is stuck playing the point. Georgetown’s offensive scheme focuses on getting to the basket. There are very few true three point threats on the team. DSR is the only player on the team who averages more than 1 3PM per game and he only shoots at a 33.9% clip. 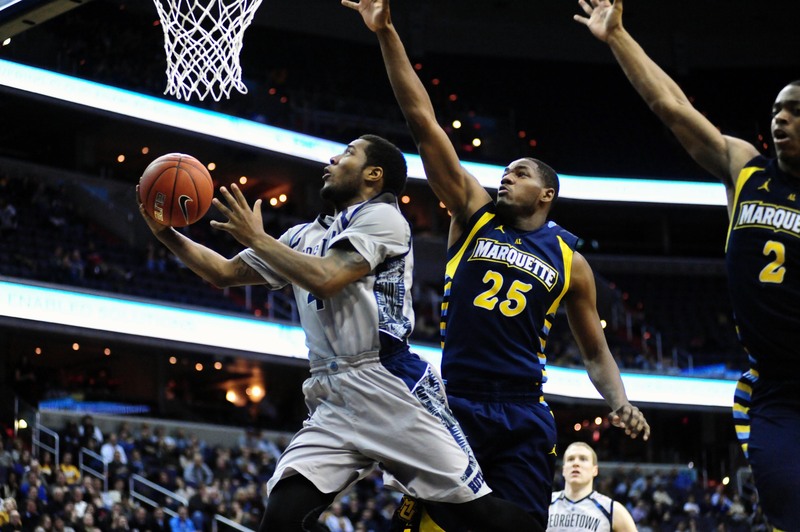 Given the poor outside shooting of their opponents, expect a healthy dose of zone from Marquette. No Hoya is better at scoring in the post than Joshua Smith. The 6-10 350 pound behemoth could be described as Davante Gardner plus. He has great footwork and excels at clearing out space in the paint. He does struggle holding on to the ball with 2.8 tpg. Look for Marquette to double team Smith in the post and attempt to force some turnovers. Georgetown’s defense is significantly behind its offense. Smith is on offensive powerhouse but a huge defensive liability. Fortunately, for the Hoyas defense, Mikael Hopkins is the exact opposite. The 6”9 senior couldn’t hit water if he fell out of a boat but he uses his long arms to dramatic effect. If Hopkins blocks your shot, expect it to end up in the audience. Georgetown’s biggest weakness is foul trouble. They have three players, Smith, Hopkins, and Jabril Trawick, who average more than 3 fouls per game. Hopkins has fouled out of 5 games this season. Trawick has ended up with 3 or more fouls in every game but two. Smith has surprisingly never fouled out, but has ended up with four fouls in 9/13 games, including all of the four most recent games. Georgetown can compensate with its deep bench but the less Hoyas available the better. Georgetown’s roster is filled with long switchables, getting to the basket is going to be difficult for Marquette. Carlino will need to make threes to open up space. Cohen’s performance in the last four games might earn him some more playing time. The true freshman is shooting 75% from the field and 67% from three in his last four appearances. Best Case: Marquette’s swarming zone is too much for the bigs of Georgetown. Every time Smith touches the ball or DSR slashes to the hoop, the zone collapses and forces an awkward shot. Georgetown takes but misses the threes required to open up the zone. Carlino hits three deep balls in the first half, stretching out the Hoya D. Juan and JjJ take advantage by driving to the hoop, right at Smith and Hopkins for some easy fouls. Duane busts out his slump by hitting two treys on three attempts. Marquette goes into the nation’s capital and walks out with a huge upset on the road, winning by 5. Worst Nightmare: Marquette attempts to swarm the post…and ends up fouling everybody. Luke goes to the bench with three first half fouls. Steve uses his patented brand of turn style defense to allow Georgetown to build a massive advantage in points in the paint. Duane’s slump continues and Carlino looks a lot more like the Depaul version of himself than the Georgia Tech version. Georgetown ends up with a 15+ rout. ← What’s up with Duane Wilson?